I was going to do an Empties' video; unfortunately, my studio is still undergoing acoustic treatment. The good news is that there are results and the echo is definitely reduced, but the bad news is that all the acoustic foam and the panels are ruining my walls, although they haven't affected the lighting. So this one is a blog post. Pity, that - I actually managed to use up quite a bit of makeup this month! I'm very proud of that; I now have a self-imposed scheme. 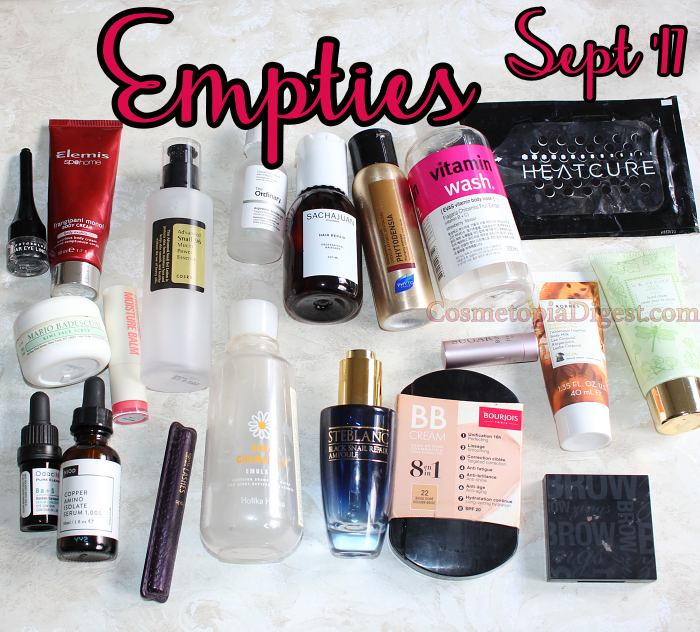 For every 10 makeup products (the same applies to skincare) that I empty, I can buy ONE product. I hope this scheme will help curtail buying in 2018, and help me finish up more. 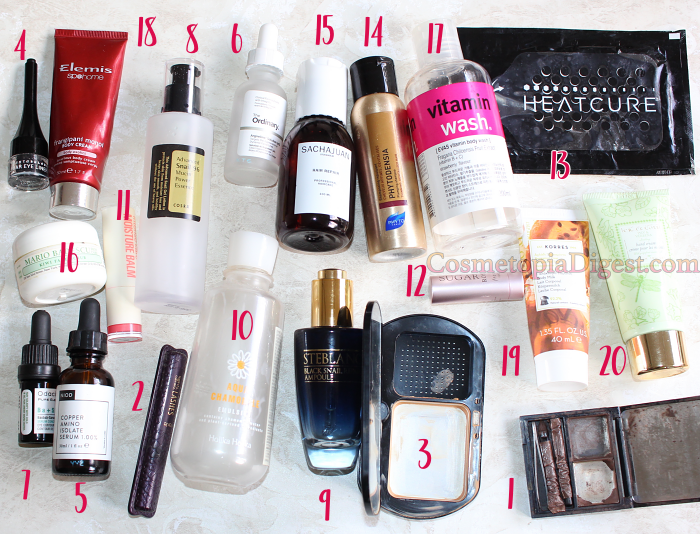 Scroll down for the beauty products I used up in September 2017, and my quick impressions of each. Repurchase? No. Gimme Brow is a lot more convenient. Am I the only one who finds that few, if any, mascaras make some kind of difference to the lashes? Or maybe my peach-fuzz is particularly terrible. Either way, wasn't a huge fan. Average. BB Cream? Wubbish, old boy. This was a cream foundation with medium coverage. Don't get me wrong, I really liked this. But it was certainly no BB cream. Or CC. Repurchase? I think they've actually discontinued it; the SA at the counter said they haven't had any in a while. My first gel eyeliner. And last. I am all about the liquid. This one started off very well, but the gel DRIES UP if you put it away for a couple of months. This is my second bottle. Despite getting some kind of weird texture on the under-eye area this time, I loved what this one does to the rest of my face. I'm on a break, but have another bottle left, which I will open only by the Holiday season. I know, I know - they say this one is for dynamic lines. BUT believe it or not, if you have acne scarring on the forehead, using this one twice a day makes a huge difference. It doesn't work on scarring elsewhere. Repurchase? I promptly bought SIX bottles. The way the world is going, war could ensue and postal services could be suspended. Perfect for layering above a lighter eye gel or cream. This is an oil-serum that occludes nicely. Repurchase? Got another one left. All hail this product! 'Nuff said. Repurchase? Two in. They are 100ml. 1. Getting the product out of the dropper was as difficult as getting blood out of a stone. I finally gave up, and upended the thing only to find that it didn't flow out too easily that way either! 2. Runnier, less hydrating and more comedogenic than my beloved Mizon Snail Repair Ex Ampoule. 3. Had a weird feel. Come on, I've used snail ampoules from various brands for a while now - and I'm calling this one alone weird. 4. The Lancome Genefique plagiarism. Repurchase? Would rather choke on my own earwax. Get it? Decent way of layering hydration. I use this after serum, before moisturiser and facial oil, for a few days after retinol. That puts dryness to rest. Repurchase? Eventually. Got other emulsions left. Peachy tinted, but lint-magnet, Besides, the bullet broke after the fourth use. I put it back, and then it broke off each and every time until I lost it and hurled the bullet into the bin, accompanied by some very colourful language. Repurchase? Would rather drown in my own vomit. I would have loved it, but it melted if you LOOKED in its general direction. I keep it at a temperature of 22 Celsius. The melting made the product gooey and squishy, and it got all over the place. Repurchase? I want to love it, but no. Fun. You remove the flap and it heats up, so the product comes out nice and warm. Leave it on shampooed hair for a bit, and rinse off. I haven't met a Phyto product I didn't like. This one isn't sulphate-free, but did not frizz up my keratinised hair. I can't pronounce this brand, but this was a very rich hair masque, and my dry locks just soaked it all in. I know it says face, but I use scrubs on my body because acne + scrub = tragedy waiting to happen. Repurchase? No, got plenty of scrubs left. Felt plasticky. Did not enjoy showering with this - I like a bit of pampering in my shower products, and this was very, very meh. Luscious and luxurious. Smells good without overpowering you with fragrance. No complaints at all, even during dry conditions. Not very thick; smells nice. Good for Summer. A regular in my stash, I rely on Grace Cole for affordable, high-quality bath and body products. They do not test on animals and do a great job with hydrating and pampering the skin.